Lyle Taylor's extra-time goal booked AFC Wimbledon a spot in the League Two play-off final after a thrilling semi-final second leg at Accrington Stanley. Having lost the first leg 1-0, Stanley levelled the tie through Josh Windass' penalty after Scott Brown was fouled. Piero Mingoia's screamer then put the hosts ahead, before Adebayo Akinfenwa's header took the game into extra time. And Taylor slotted in to make it 2-2 on the night and send the Dons through to the final against Plymouth on 30 May. Taylor's 104th-minute finish came after Jake Reeves had been denied by goalkeeper Ross Etheridge and provided a dramatic conclusion to a topsy-turvy contest, which was even temporarily halted during extra time because of floodlight failure. It was also cruel on Accrington, who were denied automatic promotion on the final day of the league season on goal difference and looked to be heading to Wembley after Mingoia's superb 30-yard strike put them 2-1 ahead on aggregate. Are Wimbledon on their way back up? The Dons, appearing in the Football League play-offs for the first time since the phoenix club's formation in 2002, now also face their first competitive trip to the national stadium since Wimbledon's famous FA Cup win over Liverpool in 1988. Manager Neal Ardley, who made over 300 appearances for the old Wimbledon FC, will lead them out at Wembley as the ninth-longest serving manager in the top four tiers of English football. The 43-year-old guided the Dons to six victories from their eight final league fixtures to secure a seventh-placed finish in the table - and they are now just 90 minutes away from reaching the third tier for the first time. Match ends, Accrington Stanley 2, AFC Wimbledon 2. Corner, Accrington Stanley. Conceded by Dannie Bulman. Second Half Extra Time ends, Accrington Stanley 2, AFC Wimbledon 2. Corner, AFC Wimbledon. Conceded by Seamus Conneely. Attempt missed. Callum Kennedy (AFC Wimbledon) left footed shot from outside the box is too high from a direct free kick. Attempt saved. Adebayo Azeez (AFC Wimbledon) right footed shot from the right side of the box is saved in the centre of the goal. Assisted by Jake Reeves. Foul by Tom Beere (AFC Wimbledon). Delay in match (Accrington Stanley). Attempt missed. Tom Davies (Accrington Stanley) header from the centre of the box misses to the right. Assisted by Josh Windass with a cross following a corner. Corner, Accrington Stanley. Conceded by Callum Kennedy. Attempt missed. Adam Buxton (Accrington Stanley) right footed shot from outside the box misses to the right. Assisted by Romuald Boco. Attempt saved. Scott Brown (Accrington Stanley) right footed shot from outside the box is saved in the bottom left corner. Assisted by Billy Kee. Second Half Extra Time begins Accrington Stanley 2, AFC Wimbledon 2. First Half Extra Time ends, Accrington Stanley 2, AFC Wimbledon 2. 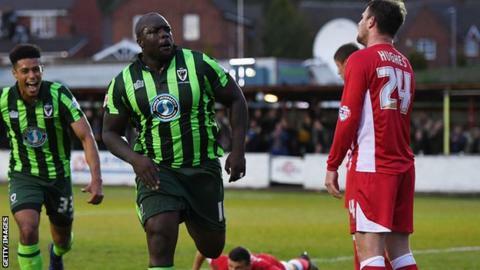 Adebayo Akinfenwa (AFC Wimbledon) is shown the yellow card. Tom Davies (Accrington Stanley) wins a free kick in the defensive half. Offside, Accrington Stanley. Piero Mingoia tries a through ball, but Romuald Boco is caught offside. Goal! Accrington Stanley 2, AFC Wimbledon 2. Lyle Taylor (AFC Wimbledon) right footed shot from the centre of the box to the bottom left corner. Attempt saved. Jake Reeves (AFC Wimbledon) left footed shot from the centre of the box is saved in the centre of the goal. Josh Windass (Accrington Stanley) is shown the yellow card for a bad foul. Attempt saved. Romuald Boco (Accrington Stanley) right footed shot from the left side of the box is saved in the centre of the goal. Assisted by Josh Windass. Substitution, Accrington Stanley. Brad Halliday replaces Matty Pearson. Substitution, AFC Wimbledon. Tom Beere replaces Andy Barcham. Offside, AFC Wimbledon. Andy Barcham tries a through ball, but Lyle Taylor is caught offside. Attempt missed. Romuald Boco (Accrington Stanley) right footed shot from outside the box misses to the left. Assisted by Billy Kee. Attempt blocked. Adebayo Azeez (AFC Wimbledon) right footed shot from the centre of the box is blocked. Assisted by Adebayo Akinfenwa with a headed pass. Offside, AFC Wimbledon. Kelle Roos tries a through ball, but Adebayo Akinfenwa is caught offside.